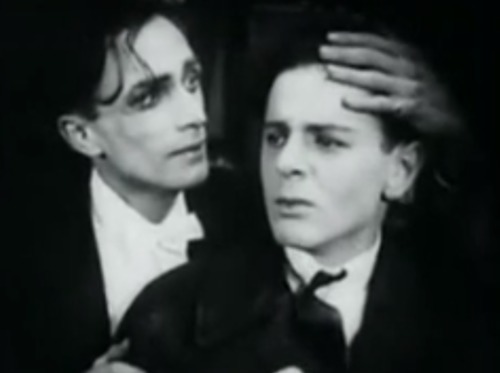 In 1919, the first pro-gay movie was made. A year later, it was banned. In 1919 – half a century before Stonewall – the first known film that was sympathetic to gay people was produced. Different from the Others (Anders als die Andern) is a German movie about a relationship between a master violinist and his student. Paul Körner, the violinist, is approached by a young man named Kurt who begs Paul to be his teacher. He accepts and their relationship develops. Their families don’t understand their relationship, and Paul comes out to his parents by sending them to a doctor who explains that Paul is gay and it’s nothing to worry about. Homosexuality isn’t an illness, the doctor says, it’s just a normal variation of human sexuality. This was 50 years before Stonewall. These ideas were revolutionary even during the brief social liberalization Germany experienced in the decade before the Great Depression, which is why public screenings of the film were banned a year after it was released. The film goes on to discuss suicide among gay men, the pressure to be straight, and blackmail used against Paul. Magnus Hirschfeld, a Jewish doctor and sexologist who rose to fame at the beginning of the 20th century and is remembered most as one of the first major gay rights activists and for founding one of the first gay organizations in the world, helped make the film. He devoted his life to trying to get the law the banned homosexuality in Germany repealed, and he believed that more education and scientific understanding could help society accept gay people. The film was produced with the help of Hirschfeld’s Institute of Sexual Research and 40 copies were produced, according to John Baxter’s book Carnal Knowledge. The Institute of Sexual Research was raided and closed when the Nazis came to power in 1933, and Hirschfeld spent the last few years of his life in France trying to continue his work before he died of a heart attack in 1935.